Rus Hemley’s pioneering contribution to high-pressure science was recognized this week with a new mineral, hemleyite, named in his honor. Hemley’s colleagues, Luca Bindi, Ming Chen, and Xiande Xie, reported the discovery of the first natural occurrence of the Fe-analogue of akimotoite in Nature Scientific Reports on February 15, 2017. The International Mineralogical Association (IMA 2016-085) approved this new mineral and its new name, hemleyite, in honor of Dr. Russell J. Hemley. Hemley is the former director of the Geophysical Laboratory of the Carnegie Institution for Science, and now a research professor at George Washington University, in Washington, DC. Hemley has been instrumental in the work of the Deep Carbon Observatory, and serves as its co-executive director. 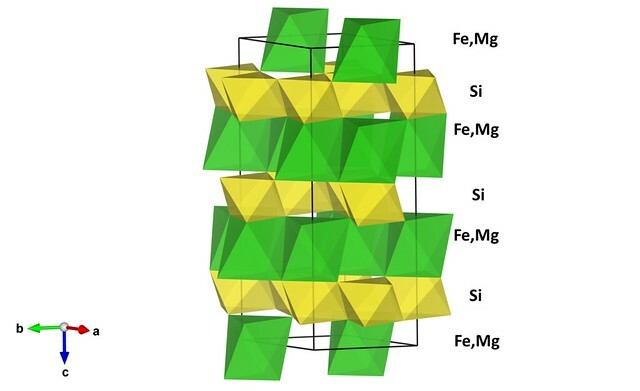 The authors describe the Fe-analogue of akimotoite, a missing phase among the predicted high-pressure polymorphs of Fe-pyroxene. The new mineral was found in an unmelted portion of the Suizhou meteorite and initially identified using Raman spectroscopy. The authors propose that since hemleyite formed in a meteorite exposed to high pressures and temperatures during impact-induced shocks, it could play a crucial role at the bottom of the Earth’s mantle transition zone and within the uppermost lower mantle. The new mineral name is a fitting tribute to Hemley, who has spent his career exploring the nature of materials in extreme environments, specifically high pressures and temperatures. He is a fellow of the American Academy of Arts and Sciences, member of the National Academy of Sciences, corresponding fellow of the Royal Society of Edinburgh, and Honoris Causa Professor of the Russian Academy of Sciences. He also serves as the director of the Department of Energy/Carnegie Alliance, director of Energy Frontier Research in Extreme Environments, and as chair of the JASON Advisory Group.